Elizabeth Warren in Senate Leadership! PCCC Raises $1 Million For Elizabeth Warren’s Allies! Debt-Free College Now a Centerpiece in 2016 Debate! By Marissa Barrow | Posted on August 14, 2015 No Comments on Debt-Free College Now a Centerpiece in 2016 Debate! Monday was one of the high points in the PCCC’s organizational history. CLINTON CREDITED THE PCCC’S ACTIVISM! 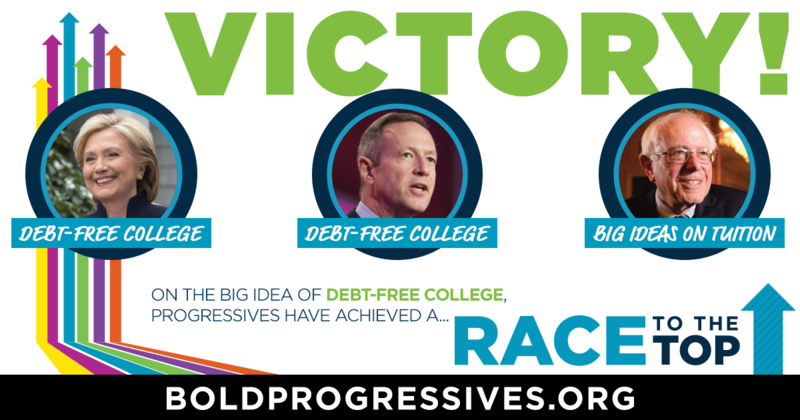 DEBT-FREE COLLEGE IS NOW A CENTRAL 2016 ISSUE FOR DEMOCRATS — SUCCESS ON THE PCCC’S GOAL! Real Clear Politics:Ai??ai???Affordable,Ai? ?debt-free college is now an economic policy plank for all the Democratic presidential candidates,Ai? ?who believe it resonates across political parties, across economic strata, and with young people as well as with their parents and grandparents.ai??? Washington Post:Ai??ai?? ?Tackling the high cost of college has emerged asAi? ?a central issueAi? ?in the race for the Democratic presidential nomination.ai??? Debt-free college means all students in America should be able graduate without debt. This big idea would expand economic opportunity, expand America’s economy, and improve quality of life for millions of people. Debt-free college is a result that can be achieved through multiple means. Below is a checklist that Demos and the Progressive Change Campaign Committee will use to judge any plan by presidential candidates or Congress. DoAi??allAi? ?undergraduate students have access to debt-free college? Does debt-free college apply toAi??allAi? ?undergraduate public institutions? Does debt-free college apply toAi??allAi? ?college costs, not just tuition? Does the ai?? ?debt-free collegeai??? plan facilitate all students having equal access to high-quality public education — i.e. incentivizing investment in instruction and student support services. Is aid distributed progressively — investing most in those who may not attend or complete college, or not maximize their participation in the economy after college, due to student debt? The G.I. Bill resulted in a 7-to-1 return on investment for our economy. By unshackling students from crushing debt — freeing them to start the next Google, start a small business, or buy a first home — we will see similar economic expansion. Quality of life will also be improved for millions of Americans who will be more able to get married, enter the career they are passionate about, or even do something as simple as moving out of their parents’ home. 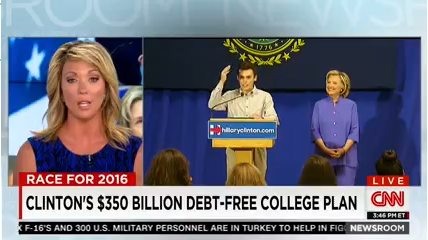 VIDEO: Clinton talks debt-free college for first time! 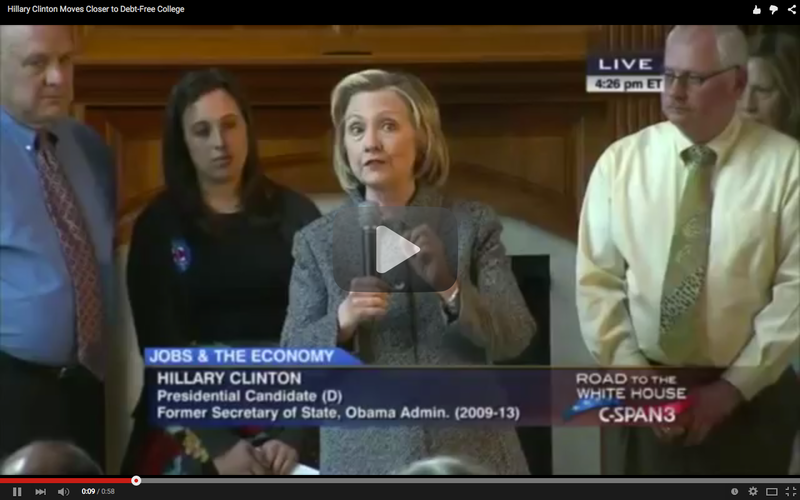 By Marissa Barrow | Posted on May 20, 2015 No Comments on VIDEO: Clinton talks debt-free college for first time! Huge news. Monday in Iowa, Hillary Clinton talked about moving toward debt-free college for the first time. Take a look at the video. The more public support presidential candidates see for big ideas, the more they will make them central to their campaigns. Watch the video. Then, join 320,000 of us on the petition urging Clinton and other candidates to make debt-free college central in 2016. PCCC has partnered with Democracy for America, Daily Kos, Demos, the AFL-CIO, NEA, the Working Families Party, Credo Action, MoveOn, and Americans for Democratic Action. In January, debt-free college rose to the top of the Progressive Change Instituteai??i? ?s ai?? ?Big Ideas Project.ai??? On the day of the State of the Union, PCI released polling data of 2016 likely general election voters that showed federal investment in debt-free college is 71% to 19% popular. It is the #1 issue that Democrats who didn’t vote in 2014 said would have motivated them to vote. In February and March, PCCC lobbied Congress. And sent field organizers to Iowa and New Hampshire. As the 2016 landscape gets formed, likely presidential candidate Martin Oai??i? 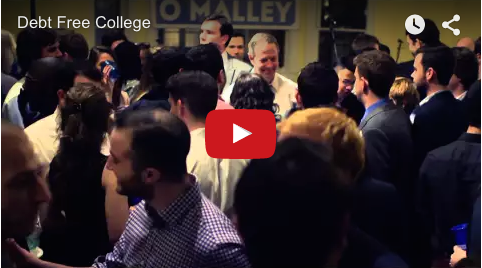 ?Malley endorsed debt-free college last Friday in anAi? ?op-ed and a national email to supporters, where he declared, “Our ultimate goal should be simple: every student should be able to go to collegeAi? ?debt-free.” Check out his email below. Sounds like a pipe dream? It shouldn’t be. When my dad returned home from flying a B-24 Liberator in WWII, the GI bill was what enabled him to go to school, open a law practice, and support a family. Today, our kids arenai??i? ?t getting the same bargain that my dad did. The majority of students are graduating with significant debt. This is debt big enough for the down payment on a new house. And instead of buying a house or starting a business, recent graduates are struggling not to default on their student loans. It’s outrageous that we can figure out a way to bail out big banks, but we can’t figure out a way to make college affordable. In Maryland, we saw this trend, and we refused to give up.Ai? ?We froze tuition at public four-year institutions, invested in higher education and financial aid, and took steps to make sure our high school students were graduating with a degree thatai??i? ?s already worth something. Now it’s time, as a country, that we do even more.Ai? ?Our ultimate goal should be simple: every student should be able to go to college debt-free. Today, I’m offering some ideas to tackle this problem of student loan debt head-on. HUGE 2016 DEVELOPMENT: 5,000 POLITICAL LEADERS URGE PRESIDENTIAL CANDIDATES TO RUN ON ai?? ?BIG, BOLD, ECONOMIC-POPULIST IDEASai??? By Marissa Barrow | Posted on April 7, 2015 No Comments on HUGE 2016 DEVELOPMENT: 5,000 POLITICAL LEADERS URGE PRESIDENTIAL CANDIDATES TO RUN ON ai?? ?BIG, BOLD, ECONOMIC-POPULIST IDEASai??? 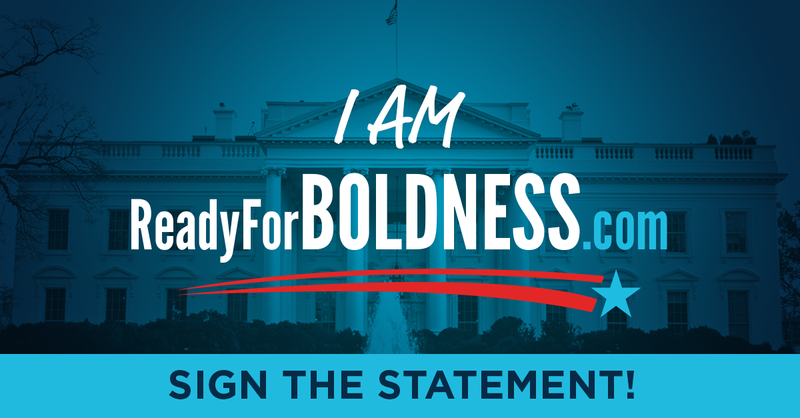 See Statement and 5,000 Signers, Sortable by State atAi??ReadyForBoldness.com. Today, the Progressive Change Campaign Committee (PCCC) is announcing over 5,000 Democratic leaders across the country have signed on to the ReadyForBoldness.com joint statement urging Hillary Clinton and all other potential Democratic presidential candidates to run on ai?? ?big, bold, economic-populist ideasai??? such as debt-free college, expanding Social Security benefits, Wall Street reform, campaign finance reform, higher wages, and millions of clean-energy jobs. Todayai??i? ?s announcement comes exactly two weeks after theAi? ?New York TimesAi? ?and others reported that 200 Iowa and New Hampshire political leaders launched ReadyForBoldness.com with the PCCC, including former U.S. Senator Tom Harkin. PollingAi? ?from the Progressive Change Institute shows that ideas in todayai??i? ?s statement are popular with voters of all political stripes. In addition to building national momentum for the joint statement, the PCCCai??i??sAi? ?Ready For BoldnessAi? ?campaign is recruiting volunteers in early primary states to attend campaign events and ask candidates whether they support economic-populist ideas. Late last night Senators Elizabeth Warren (D-MA) and JoeAi??ManchinAi??(D-WV),Ai? ?together with Patty Murray (D-WA), Sherrod Brown (D-OH), and Brian Schatz (D-HI),Ai? ?introduced an amendment on the Senate floor to expand Social Security benefits.Ai? ?As a result,Ai? ?each Senator who was present is now on-the-recordAi? ?as for or against expanding Social Security benefits. Supports ai?? ?the sustainable expansion of benefits under the Social Security program.ai??? Supports ai?? ?making permanently solventai??? the Social Security and Disability Trust Funds. Would require those changes to be fully paid, deficit-neutral. Full text of amendment 1094Ai??here.Ai?? Third Way attacked Warren’s economic populism inAi? ?a WSJ op-edAi? ?in Dec 2013 andAi? ?admitted laterthat the attack was prompted byAi??herAi? ?floor speechAi??onAi??Nov. 13Ai? ?saying, “we should be talking about expanding Social Security benefits ai??i?? not cutting them.” PCCC and othersAi??defendedAi? ?Warren, got multiple Third Way co-chairs to drop their affiliation, and a PCCC protest at Third Way’s officesgot them to admitAi? ?the majority of their money comes from Wall Street firms that would love to privatize Social Security. Tom Harkin, from the first presidential state of Iowa, was theAi? ?initial senatorAi? ?to propose expanding benefits. Sherrod Brown from the key presidential state of OhioAi? ?will be re-introducingAi? ?it this Congress. “After Republicans took over the House and there was talk of a Grand Bargain, Harry ReidAi? ?caught the Washington chattering class by surprise and attracted the affection of millions of Americans when he declared, ‘Leave Social Security alone.’ He has been one of the most stalwart protectors of Social Security, and it’s fitting that he announced his retirement hours after voting to expand Social Security benefits — the Warren-Manchin amendment. “HarryAi??ReidAi? ?has been a strong fighter in the Senate for working families, standing against corrupt trade deals like the Trans Pacific Partnership, and we’re grateful he’ll be there for this important fight the next 22 months. Americans thank HarryAi??ReidAi? ?for his many years of hard work and his strong values. “Fortunately, Senate Democrats have a great bench — an increasingly progressive bench with leadership on many issues. — The Progressive Change Campaign CommitteeAi?? Contact TJ Helmstetter, director of media relations. Hi. This is KeithAi? ?Ellison, Co-Chair of the Congressional Progressive Caucus. Yesterday, House Republicans offered their same old budget that privatizes Medicare and hurts seniors, students, and working families. Today, I’m proud to stand with my colleagues, unions, the PCCC, economists, and others in announcing The People’s Budget — the progressive budget alternative. The People’s Budget endorses many of the “big ideas” that progressives like you and voters of all political stripes support: Investing in millions of good-paying jobs, making college debt-free, expanding Social Security benefits, reforming our broken campaign finance system, and investing in clean energy. It closes tax loopholes for corporations that ship jobs overseas and makes Wall Street, millionaires, and billionaires pay their fair share. Our budget will get a vote on the floor of the House of Representatives. Will you help show the wide public support for The People’s Budget by joining me as a citizen co-sponsor today? There are 70 of us in the Congressional Progressive Caucus. Your signature will help us convince our colleagues to vote for these big, bold, economic populist ideas. I talk to colleagues on the House floor all the time, and telling them about grassroots momentum really makes a difference. Investing over $1.9 trillion in America’s future. Creating 8.4 million good-paying jobs by 2018. Investing $820 billion in rebuilding our roads, schools, and bridges. Making college debt-free through federal assistance to states for public colleges and universities. Endorsing an expansion of Social Security benefits to keep up with seniors’ true costs. Itai??i? ?s official — Donna Edwards is in! Thousands of PCCC and Democracy for America members across the nation urged Donna to run for U.S. Senate in Maryland, and she heard us loud and clear! 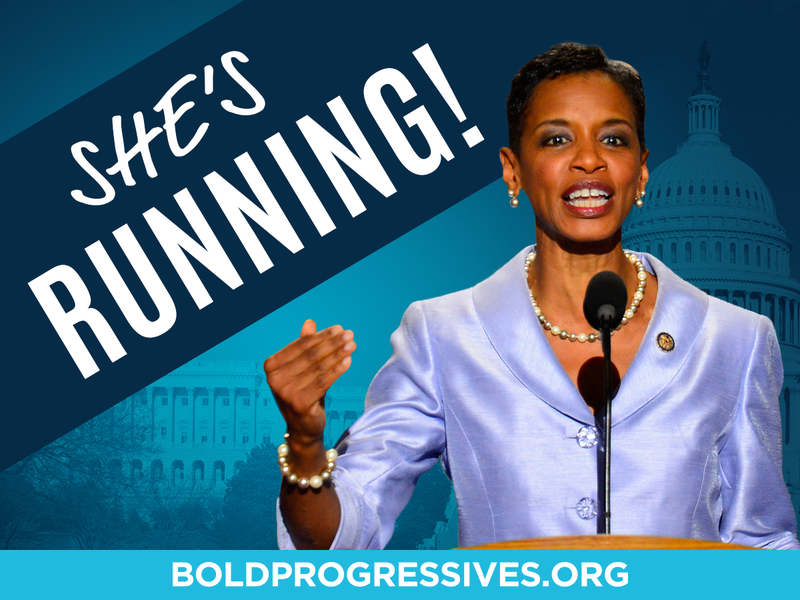 Chip in $3 to help bold progressive Donna Edwards start her campaign with momentum! Donna Edwards has proven time and again that she’s a bold progressive. She’s not just an ally — she’s one of us. Donna started as a community activist. Then, she was aAi? ?founder of a progressive nonprofit. In Congress, she’s devoted her time to taking on powerful interests — even defeating an entrenched Wall Street Democrat to win her seat. Donna was the first member of Congress to introduce an amendment to overturn Citizens United.Ai? ?She led the National Network to End Domestic Violence. And Donna agrees with Senator Elizabeth Warren that we should expand Social Security benefits — never cut them. Donate $3 to fuel Donna’s campaign today! Corporate “New Democrats” have been attacking the “Warren wing” in the press. They think the way to win is to cozy up to corporate interests and protect the status quo. The way bold progressives fight back is to elect more people like Donna Edwards. Like Massachusetts, a state as blue as Maryland can give the nation the gift of a bold progressive leader.